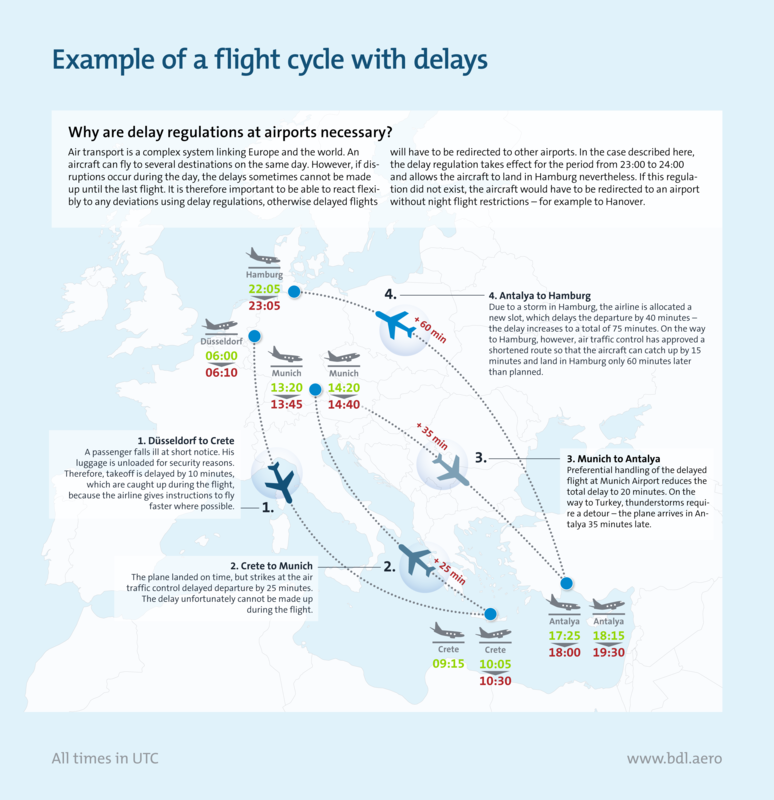 What does aviation do with regard to punctuality and reliability? The airlines work on new flight plans several months in advance. In the process, they consult with airports and air traffic control and take account of existing capacity in order to avoid bottlenecks and to establish the most stable flight plan possible. In addition, the airport coordinators of the individual states are involved; they allocate slots (time windows for the takeoff and landing of a given aircraft at an airport) and thus ensure that there are no capacity bottlenecks in the planning scenario. Reliability and above all punctuality are decisive criteria for customers when choosing a mode of transport. For this reason alone, aviation companies have a great interest in reliable and punctual flight operations. In addition, irregularities or delays in air traffic have a considerable impact on the further operations of the daily flight schedule and on the entire network. They may lead to subsequent delays for further flights by the aircraft in question, which may continue to build up over the course of the day and, in the worst case, even affect the start of operations on the following day. Despite good planning, there are influencing factors that can affect the actual daily operation. These can be external issues that cannot be influenced, such as extreme weather events with thunderstorms or strikes, but also organizational or technical problems, such as technical problems with an aircraft or staff absences due to illness. In practice, this means that deviations from the schedule may occur during daily operation. For example, if passengers who have already checked in do not arrive in time or do not arrive at the gate at all, their baggage must be unloaded again for security reasons, which can lead to delays. Occasional extreme situations such as thunderstorms or strong winds in the approach and departure areas require the aircraft to fly at a greater distance apart and thus reduce the available capacity in the airspace. Knock-on delays can hardly be prevented or reduced by the companies. These occur when an aircraft is not ready for departure in time and thus cannot meet the allocated departure window. As a consequence, the flight must be realigned with current operations by air traffic control. This means that any simple delay may result in a longer follow-up delay and that the entire daily rotation can no longer be flown according to schedule. In 2018, several causes for delay came together, some of which exacerbated each other. On the one hand, these were special factors such as air traffic controller strikes in Europe and significantly more thunderstorms in the first half of the year than is normal for seasonal reasons. And the Air Berlin insolvency was also a critical special factor. The companies that took over the aircraft and crews of the insolvent Air Berlin had to overcome major integration tasks, and they pointed out early on that this would be difficult and would take time. 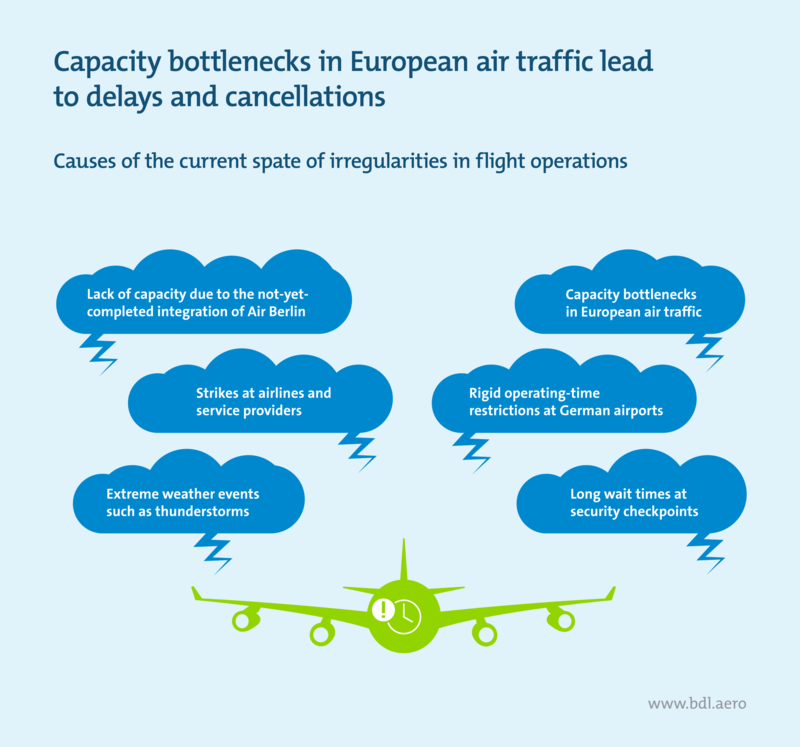 But there are also structural capacity bottlenecks that need to be overcome, particularly the capacity bottlenecks in air traffic control in Europe. And in Germany there are efficiency deficits in state aviation security checks and personnel bottlenecks at border controls. Long lines at security checks, increasing delays and flight cancellations do not meet the quality standards of the aviation industry. In order to stabilize the flight schedule, airlines are increasing their staff, holding reserve aircraft and stand-by crews or setting longer block times with sufficient time buffers. In addition, the processes on the ground (on the apron and in the terminal) and the use of airspace are continuously optimized. When possible, time-critical and delayed flights are handled with priority. In May 2018, DFS and its European partners also began to improve the utilization of traffic hubs and reduce traffic in the upper airspace, which is particularly heavily frequented. This is mainly done by shifting flights to lower, less-frequented flight areas. The capacity of the airspace must be increased. This will require a stronger initiative by the EU and its member states to overcome the fragmented organization of air traffic control in Europe and the absence of civil–military integration. Efficiency in the handling of the aviation security checks must be improved. To this end, the coalition’s declaration of intent to make processes more efficient and to assume part of the rising costs must be implemented swiftly. Lines at border controls must be reduced. This requires the provision of additional Federal Police personnel.